I first met Niki at DoubleTree Hilton Liverpool’s Wedding Open Evening where I was exhibiting not long after opening in 2016. We had a fab chat about her and her fiancé Pete. “Pete and I met at my birthday house party, however we knew each other before from group country walks. Pete walked into my house and I was blown away how gorgeous he looked, he still makes my stomach flip with excitement when he walks in the room” says Niki. Niki and I also chatted Wedding plans, and about vegan wedding dresses. I’ll be completely honest, at that point in my bridal shop journey I hadn’t considered what this meant so it was great to have my thoughts opened up to what my brides might be looking for. A few months later Niki came to Bridal Reloved Liverpool to look for something unique to match her quirky style and vegan beliefs, and we found her ‘the one’. A stunning Enzoani A line gown, which after our consultations Niki also had customised by Sophie from Recovamp to match her red wedding colour scheme, adding a red lace corset back and hand made red rose to her gown. Simply unique! 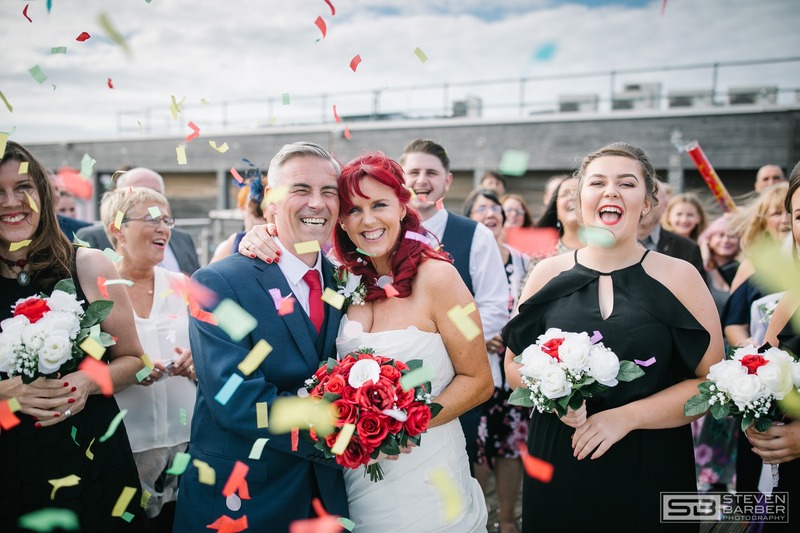 Niki and Pete married at Crosby Lakeside August 2017 in a personal ceremony attended by 60 day and 80 evening guests, “It just felt perfect, nothing quite compared to it and we loved being so close to the beach. Crosby Lakeside were amazing, considering it was their first vegan wedding the food was gorgeous and the room transformation was incredible!”, said Niki.